Prathu's Food: Aloo Bhujia - Passionate Cooking for Vegeterian Food. Hello buddies. 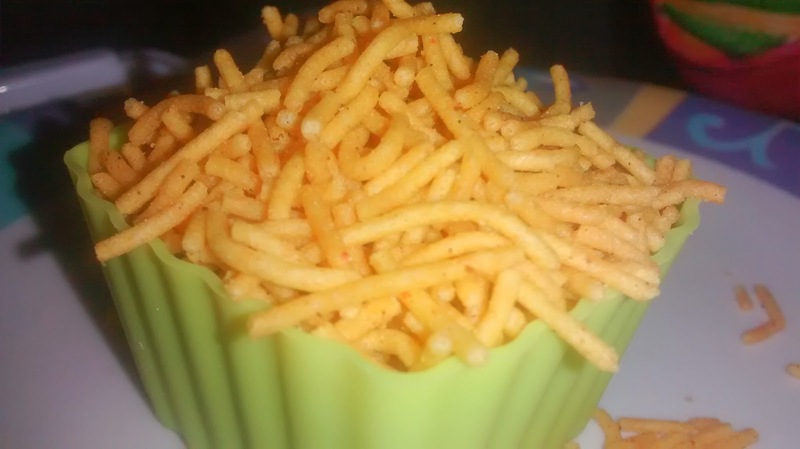 This time I am posting every ones favourite namkeen allo bhujia which is very easy to make in very less time. i am posting this for SSshh Secretly Cooking event hosted by priya of Priya's Versatile recipes. This month I got Joanne of WhatsOnTheList. Chaat masala – 3 tablespoond and 3 table spoons for sprinkling on to(adjust). Mix besan, grated potato and oil in a pan. Add salt, 3 tablespoons chaat masala, red chili powder, hing, baking soda and lemon juice. Add very little water and knead to make a tight dough. Cover and keep the dough for 10 minutes. Divide the dough in 4 parts. Fill one part in the sev press fitted with fine net. Press the sev press over the hot oil. Fry till golden brown from both the sides in simmer. Remove from oil on a kitchen tissue lined plate. Break the bhujia into small pieces. Sprinkle the remaining chat masala and dry pudina powder on top.